Damian spent a number of years as Ian Milton’s passenger on his Tiger 110 powered Triumph outfit. During that time, at some point in the 1980’s, Mark Jackson, a noted sidecar passenger and motorcycle engineer gave Damian a Vic Plumer built frame which had passed through many hands but had never been completed. It had been butchered from its original design as a front exit and an attempt had been made to turn it into a rear exit unit. After Milto had his accident at Carnell Raceway, his outfit was eventually repaired and then sat idle. Robert’s son Dylan was always keen to have a go at sidecar racing, but had to wait until he was 16 years old to try. Milto was kind enough to offer the use of his outfit so Dylan could have a go at Carnell. Dylan had a ball on the Triumph and also had a go on Dave Buxton’s modern outfit. Robert and Damian then started to use Milto’s outfit while he recovered. The bug was back ti build something of thier own so Milto was approached, “do you still have that frame in the shed mate?” Which of course he did. Robert just happened to have a couple of spare Honda 4 engines, so Damian got to work with the help of some mates and over the course of about a year the outfit slowly took shape. The rear suspension was originally rubber blocked, so the frame was modified to accept twin shocks. Mick from Tranzac made the exhaust pipes, and Murray from Retro Motorcycles did the engine work and generously continues to give his time to work on the outfit. A quick glance at the finished product often has people wondering why certain items were used on it. Like most home made things it was not built to a particular design, but rather from what was laying around. We eventually trotted it out at Morgan Park on Saturday July 21st 2007, we had a few issues as one does with anything new. Different problems plagued us over the next few outings, but we eventually got to the point where we were circulating regularly. 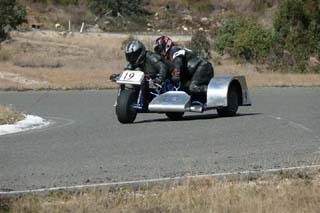 During the 2008 season we had only one DNF, at Carnell on the last lap of the last race when the sidecar wheel came adrift. The outfit remains a work in progress with small modifications being carried out as necessary. The engine is absolutely stock except for slightly higher compression pistons, the outfit is overweight, under powered, under braked and carries around "two fat bastards", so we think it does a great job. We have heaps of fun on it and after all that is precisely why we do it. The cost to build the outfit, including tyres and buying Brian Payne’s old trailer was just over $2000, so it has been a reasonably inexpensive entry to the sport. We started off using #9 as our preferred racing number, but when we tried to register that number with MA we were unable to do so, instead we settled with #43, which is the number MA issued us. 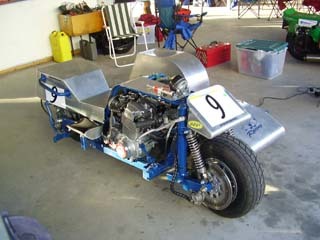 In 2008 the outfit came third in period 4 in both the Queensland Titles and the Southern Downs Challenge.